Winter houseplant care is an issue that most gardeners new and old can have problems with. Unless you're blessed with an attached greenhouse, there are some changes that need to be made in your normal care routine for the winter months. Winter can be especially hard on houseplants. Most of them are tropical in nature and the drafty and dry winter household environment can cause problems. Lack of sun can also be a problem, although not as much as the low humidity that most homes in the Midwest experience in the winter. Most plants go into a dormant period in the winter, so winter houseplant care is different from the care you give your plants the rest of the year. During this period, water and fertilizer requirements will drop off. It's generally recommended that you not fertilize foliage type houseplants from October through March. Once growth begins again with the increased daylight in spring you can go back to your normal fertilization routine. The need for watering is usually less during the dormant period, but the heating system in your home can actually increase the need for watering when coupled with the lower humidity, so you still need to be vigilant. Plants that did well in a southern window during the summer might not do as well in the winter, but those who like reduced light might do well in these windows in the winter time. Experiment with moving the plants around. Plants that are mainly foliage shouldn't be fertilized as part of your winter houseplant care as noted above. Plants that flower such as African Violets, Primrose, or Poinsettias will benefit from regular feeding. We like to use a balanced liquid fertilizer that is added to the water we use to water these plants. Proper watering is a crucial part of winter houseplant care. Water the plants when the top of the soil is dry to the touch. Some houseplants don't like to get their leaves wet and none of them like to stand in water. For most of them watering from the bottom by placing the pot in a tray of water works fine. Use water that is room temperature and set the pots in the water so they'll soak up the water they need. In our experience, some plants such as Croton "Mammy" and China Doll are especially sensitive to water and can dry out quickly, dropping their leaves. These plants may benefit from a soil covering mulch such as pebbles or bark. We like to use rain water to water our houseplants and have a barrel in the basement that we fill up in the fall when we drain the outside rain barrels for the winter. One of the most important things to remember about watering is that different plants have different water needs, and above all, their roots need to breathe so don't ever leave them standing in water. Some folks like to keep their houseplants in a normal pot set inside a decorative container that has no drainage. If you do this, let the inside pot drain before placing it back in the decorative container after watering, or add some stones in the bottom of the decorative container so that the plant isn't sitting in water. Many people like to supplement the winter sunlight with artificial lighting, and many people don't understand how light works. The intensity of light drops off as the distance from the light source increases in a relationship called "inverse square." What this means, simply, is that when the distance from the light source increases, say from one to two feet, the intensity of the light is ¼ of what it was (brightness/2 squared). At three feet, the intensity is 1/9th and so on. An example would be using a plant grow light on your plants. If you place the light four feet from the plants, the intensity of the light reaching the plants will only be 1/16th of the intensity if the light was placed one foot away. These examples illustrate a ratio and the result is the same whether you measure in feet or meters. Whew, that's enough math! The basic rule of thumb is the closer, the better. But be careful that the heat of the lamp doesn't damage the plant. You need to figure what you can do within reason to benefit from artificial lighting. Misting them daily with a spray bottle. Setting them on a tray with pebbles and water in it, as long as the pot isn't sitting directly in the water. Placing a bowl of water on the radiator if you have them. 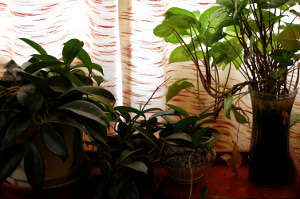 Hot and cold drafts can confuse the heck out of your houseplants. Avoid keeping them where the heat vents will blow directly on them. Also, watch plants that are sitting on a window sill so that their leaves don't come in contact with the cold window pane. Tropical plants are generally comfortable in the same temperatures that humans are and like it a few degrees cooler at night, if possible. Follow these tips and proper winter houseplant care is really pretty easy to do.